HICKORY, NC (January 2, 2018) – Transportation Insight, a multi-modal Enterprise Logistics Provider, is recognized as a top provider of technology solutions helping food and beverage companies improve productivity and gain efficiency. 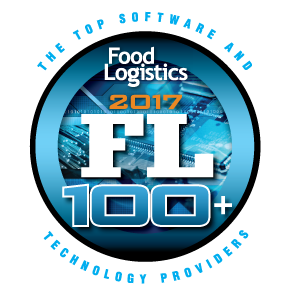 Included among Food Logistics annual FL100+ Top Software and Technology Providers list for the fifth consecutive year, Transportation Insight was selected for its ability to improve clients’ supply chain results through a technology platform that facilitates optimal mode and carrier selection, comprehensive data management and logistics reporting, and what-if supply chain mapping and forecasting to drive process improvements, reduce costs and enable sustainable growth. Transportation Insight’s bundled Enterprise Logistics solution enables food and beverage companies to access, trace and verify information from suppliers, operations, packaging and transportation in order to maintain appropriate documentation demonstrating compliance. By combining TMS and freight invoice audit and payment with a cloud-based business intelligence platform, Insight Fusion®, Transportation Insight provides supply chain visibility from origin to destination to help proactively prevent issues arising from spoilage or shelf life. Transportation Insight leverages this blended stack of off-the-shelf and proprietary technology to improve carrier sourcing, automate execution processes for multiple modes, control and manage freight spending and collect, store and analyze data. As a result, the supply chain strategist provides clients with vast supply chain data assimilated into actionable business intelligence. Transportation Insight Vice President of Consumer Products Solutions Rick Zaffarano’s in-house expertise in food, beverage and consumer packaged goods is noted as a differentiator by Food Logistics. A 2017 Food Logistics Champion, Zaffarano leverages more than 30 years of experience in food, fresh and CPG industry distribution operations, logistics and supply chain management to help supply chain executives improve supply chain control, real-time visibility and chain of custody awareness from suppliers, carriers and distribution centers to the end customer.